The early morning adventure begins as you meet at our North Phoenix office: 715 East Covey Lane, Phoenix, AZ 85024. Make sure you bring your camera! After check-in, you’ll step into our chase vehicles and be driven to one of our various launch sites. From there the pilots will begin the inflation process, giving you the opportunity to become an involved, “hands on” crew member as the gentle giants come to life. You may also choose to observe inflation and take pictures as the sun rises over the hills of the Sonoran Desert. At lift off you’ll embark upon a journey of uniqueness. 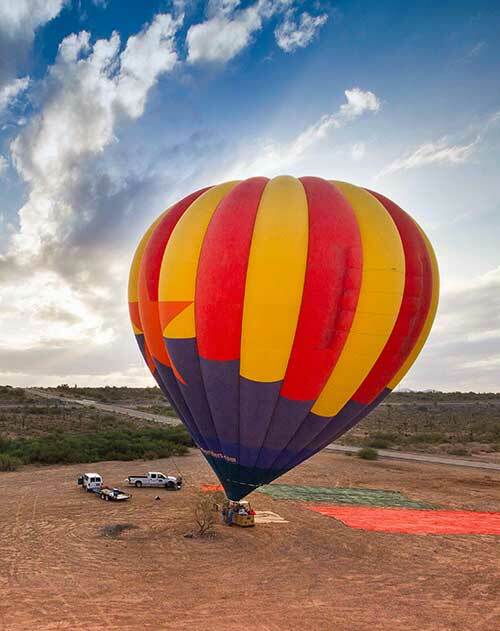 Enjoy breathtaking views of the Sonoran Desert while floating across the sky. Send your greetings to the earthbound folks below! After landing, indulge in our Sonoran Sunrise Gourmet Breakfast post-flight celebration that is as unique as the desert it is named after. Toast to your aeronautical experience with our signature Prickly Pear Cactus Mimosas while snacking on locally crafted favorites of Arizona. Choose from a beautiful medley of offerings with Arizona mesquite smoked turkey breast, assorted fine cheeses, seasonal fresh fruit, local Hickman’s eggs, and uniquely crafted croissants. Locally charged Southwestern culinary dining in the middle of the Sonoran Desert is an experience only had by guests who have soared the spectacular golden sunrise skies and let Mother Nature choose the dining location. It is an adventure with such diversity, only the Sonoran Desert wildlife can match. Finally, you will be presented with a flight certificate to commemorate your aeronautical experience.